You are currently browsing the tag archive for the ‘Travel Spain’ tag. Having just finished the Camino de Santiago in June, I thought it would be useful to put down some general pointers for anyone who’s interested in walking this ancient pilgrims’ route themselves. Our Compostellas. Written in Latin and where possible, carrying a latinized version of your name. As a quick introduction, I walked the Camino in two parts. The first half, from Pamplona to Leon in 2004, and the second half a month ago from Leon to Santiago. In those eight years the interest in the Camino has increased enormously, with many websites, guidebooks and even a Hollywood movie (The Way), jumping on the bandwagon. As a sign of how mainstream it has become: My local outdoor store in Dublin had a special section of their floor devoted exclusively to the Camino. As is to be expected, the number of people walking the route has increased dramatically as well, more than doubling over the last decade. 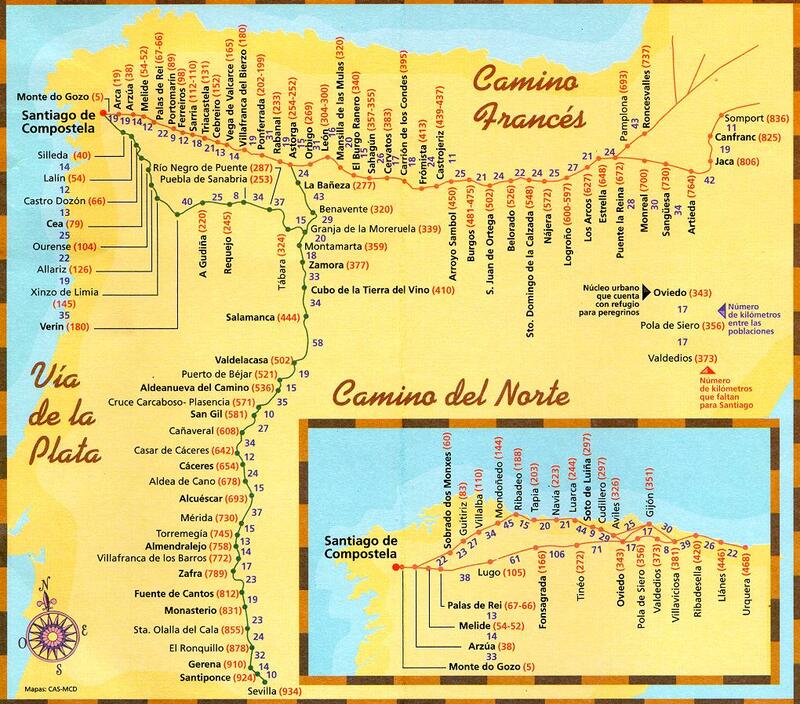 This has caused especially the Camino Frances to become more crowded, but on the upside has also led to a wider variety of accommodation and other pilgrim facilities to be built. So if you’re planning to go as well, here are some things to consider before setting out. Even though everyone speaks of the Camino as if it were one fixed route with a specific beginning and series of waypoints, there are in fact many ways to get to Santiago. Pilgrims in the Middle Ages would start on their doorsteps and walk towards Spain, meeting up with other pilgrims in the cities and towns of medieval Europe, such as Paris or Le Puy-en-Velay. Several routes became more or less standardized along the way. A map showing the different routes through Spain and Portugal. You can of course start even earlier. Routes through France are quite popular. 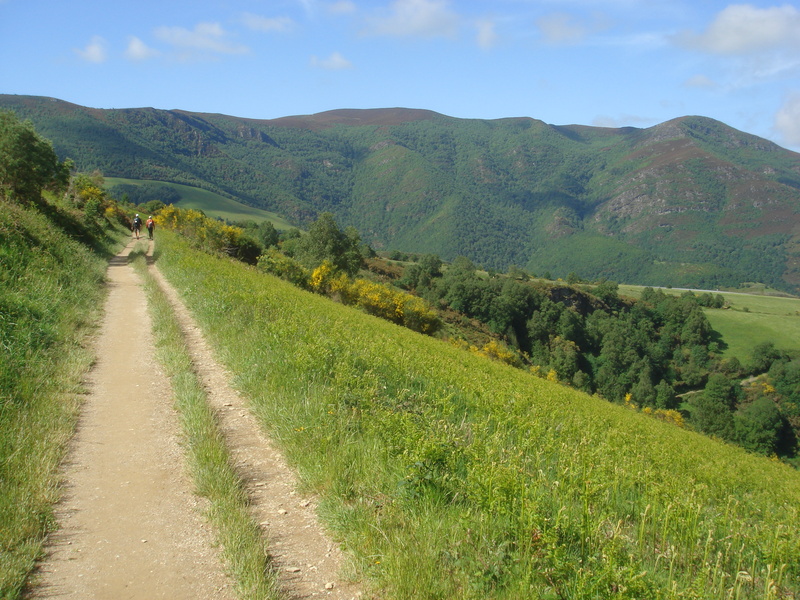 The most common one that takes you through Spain today is the Camino Frances which usually begins in Saint-Jean-Pied-de-Port on the French side of the Pyrenees, and passes through Pamplona, Burgos and Leon. Another route hugs the Atlantic coast and is known as the Camino del Norte. Additionally there are routes coming from Madrid, Portugal and even a short one from the coast where travellers from Ireland and England would have landed. So which one should you take? The Camino Frances is the most popular. It passes through many medieval towns and villages and the uptick in pilgrims on this route means there is often a choice of albergues (hostel-like accommodation for pilgrims). They are rarely more than 10 kilometres apart. The downside is the other side of the popularity coin. You will not often walk out of sight of other pilgrims. In our nineteen days on the Camino this year, we had exactly one morning in which we did not pass or were passed by other pilgrims. If you prefer the quiet, the Camino del Norte may be the way to go. The downside here is that there is less accommodation and the distances between albergues can be larger at times. Also, you won’t get to watch The Way and recognize all the spots that Martin Sheen is passing by. One last pointer, whichever route you take, have a think on whether you want to start on the French or Spanish side of the Pyrenees. Each year a substantial amount of people wear themselves out on that first tough march across the mountains. It’s not compulsory. 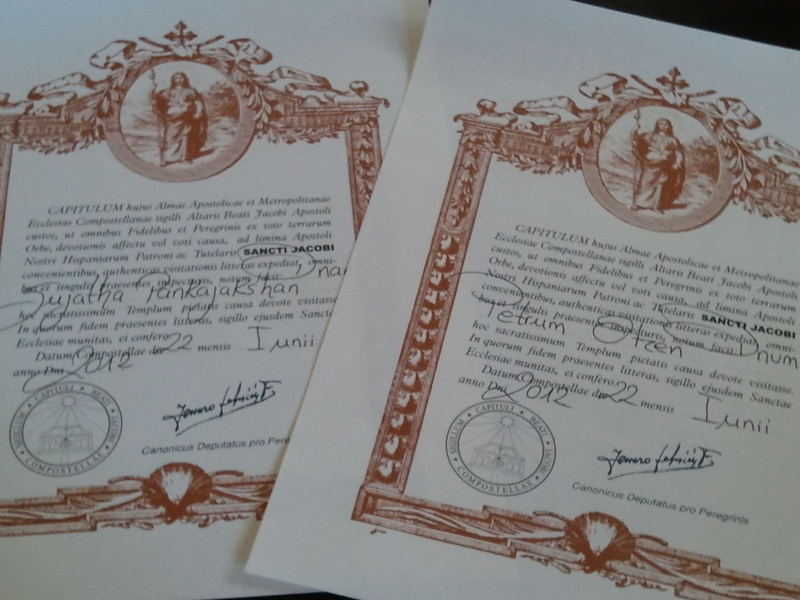 In fact, you only have to walk a hundred kilometres to get the coveted Compostella, so there. Northern Spain is colder than you might think. 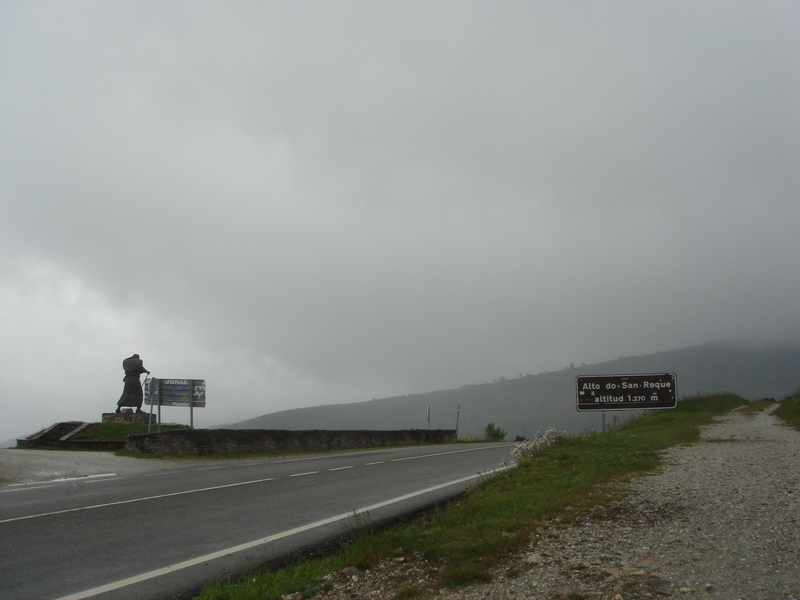 I discovered this back in May 2004, when it started to snow a little after Burgos. Having packed one sweater and only a rain cape as outer wear, it was decidedly frosty. The lack of hot showers at the time didn’t help either, but that has mostly been remedied these days. Rain clouds on the Alto de San Roque. The last peak (1,270m) before heading into the final stretch of the Camino in Galicia. Winter, from November to March. Can get very cold. Expect to have the Camino almost entirely to yourself. Expect to have to hunt around for keys to albergues as many of them will be closed. Spring, from April to June. Generally mild conditions but always be prepared for extremes. It can snow in May, but temperatures can also rise to the high thirties centigrade. It gets busier on the route as the weeks pass in May and June. Summer, July and August. Some like it hot. As most Spanish walk the Camino at this time, the route is at its busiest. Temperatures can touch the forties which leads to much night-time walking to avoid the summer heat. Autumn, September and October. Very similar to spring conditions. Crowds are less than in the summer, but still busy enough and cold spells become more common as winter approaches. You’ll always need a good windbreaker as weather can change quickly for the worse in the mountains. The Meseta, the high plains between Burgos and Leon offer very little shade and can be difficult to cross in hot or stormy weather. Galicia, the final province the Camino passes through is very green. That’s because it rains there. A lot. Traditionally, a pilgrim would put his belongings in a backpack, carrying a few sets of clothes, a sleeping bag and some toiletries and start walking. It gives a sense of freedom, being able to go as far as you like at any given day, and stopping where you will (accommodation permitting). Of course, it also means carrying a load on your back, though with modern light-weight materials that doesn’t need to add up to more than 10kgs. 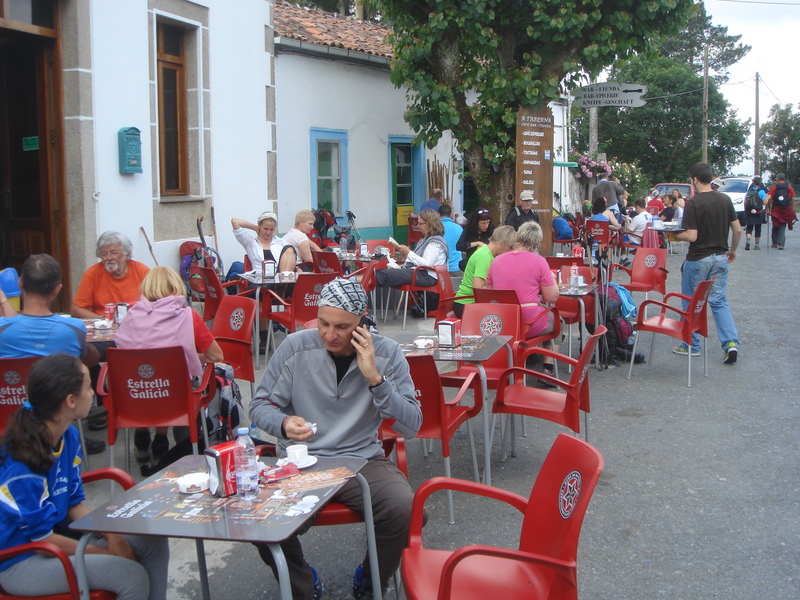 The Camino gets busy with all sorts of walkers in the last 100 kilometers before Santiago. These days, there are several other options. The first is walking the full length of the Camino, but having your bags transported for you. You’ll only need to carry a day pack with water and some other necessities. The cost can be as little as €5 per day and pick-ups and drop-offs can be arranged with a quick phone call. One thing to bear in mind is that some of the albergues do not allow ‘assisted’ pilgrims, so you may be more limited in your accommodation when you use a service like this. You can ensure a spot for the night by booking with an operator that offers full packages including hotel bookings, so you’re not dependent on the albergue network. Be aware, though, that if you book with one of these you are essentially committing to walking specific distances each day, and it’s hard to know how your body will hold up in advance. The second option, for the less active among us, is the bus tour. It’s essentially a week-long, or ten-days, or whichever time period suits, journey in a bus that includes a bit of hiking each day. You stay in hotels, get to visit some other nearby sights and will be dropped on the Camino for a five to ten kilometre stretch of walking each day. At that time you will be all fresh and happy as you traipse by the unfortunate pilgrims who’ve just lugged a heavy backpack up a mountain for the past three hours… through the rain… in the mud… No, no, I’m not begrudging you your comfort. Not at all. If there’s one thing that will determine your enjoyment of the Camino, it’s how well your shoes fit. Make sure that you have plenty of time to break them in. If you can, go to an established outdoor store, try on a couple of different pairs, and don’t be afraid to go back if they’re causing you trouble. They don’t have to be expensive. Since the Camino is on relatively easy-going surface for the most part, you won’t need that high-end Mount Everest type of shoe. Personally, because of a weak ankle I prefer a boot, but plenty of people use walking shoes as well. Consider in-lay soles to cushion the impact on your knees and shins, as substantial parts of the Camino follow paved roads. People walk the Camino with no stick, one stick or a set of two hiking poles, and generally feel very strongly about their personal preference. The basic advantage is that using them takes weight off your legs; it can aid balance, and it prevents your hands from swelling as you keep them up by holding the stick. The disadvantage is that you always have a pair of sticks in your hands. To me there are no real rules about this one, but you’ll probably have a preference for one or the other, so give them a go before setting out.